I was a typical headstrong, independent, strongly opinionated teenager who never hesitated to say “NO” for food cooked using particular vegetable or greens. With 90%+ vegetables and greens which belonged to my black list, it was not an easy task for my Amma to cook something which every family member loved. For me Green Leafy Vegetables were simply horrible to look at let alone taste it. Root Vegetables were loaded with little too much of carbohydrates for my taste. This strange piece of information I seemed to have picked from our Botany class taken by handsome lecturer with cute dimple on his left cheek whenever he smiled and I could see every girl in my college falling for!!! And there were not many vegetables which grew above ground level that caught my fancy. So what did I really eat as a teenager? If your answer is junk food containing lots of deep fried, greasy, spicy, bubbly, unhygienic food cooked every other place except home, then think again. Like many millions caring, smart mothers all over the world who knows what to cook for their opinionated kids, my Amma too smartly belonged to that category. Amma always made it a point to sneak vegetables in our diet without giving us much choice other than eat it grudgingly. Grudgingly because I knew it contained the greens and vegetables which I simply hated but still the taste made it for everything else. Amma made Uttappas, Stuffed Parathas, low fat Veggie Burgers, grilled Vegetables which I couldn’t resist in spite of not being very fond of veggies and greens. Now when I think of it I cant help but wonder how Amma managed to hide her smile when she saw me stuffing all these goodies one after another with a typical teenager ‘don’t you dare to laugh at me or lecture me’ look on my face. Its not easy being a cool and bindas teenager in India I say! One vegetable I loved to hate was Cauliflower. I was never fond of this stinking vegetable and always rolled my eyes at people who would go gaga over its shape, texture and taste. It was great unsolved puzzle for me to see people adoring this vegetable which smells (read stinks) and tastes like cabbage, yet another vegetable that topped my hate list. As usual all my theories of why we should ban Cauliflower dishes went to deaf ears of my Mommy dear and as if I really had any fat chance of making her change her mind. Right when I was grumbling as how bad it smells, Amma grated it while I covered my nose with a hanky. My entire lecture on ugly cauliflower, how stupid it was to look at and how I had rather eat cow dung in its place, went to deaf ears. She gave me knowing smile and went on adding a pinch of this and a dash of that and with in few minutes this stinky vegetables dressed with aromatic spices was stuffed in a whole wheat dough and rolled flat. Cooked to perfection with little bit of Ghee on both the sides it smelled almost heavenly to my utter disbelief. She placed this perfectly round, hot, delicious smelling Gobi ke Paranthe with a small bowl of Yogurt and my favourite Pickle in front of me and asked me to taste it if I wanted. I not only tasted it but reluctantly asked for more. Since then I am completely hooked to this delicious Cauliflower/Gobi Parathas which is second best thing to Aloo/Potato Parathas for me. Served simply with a cup of thick home made Yogurt and spicy Pickle, it sure to win every Cauliflower haters hearts. 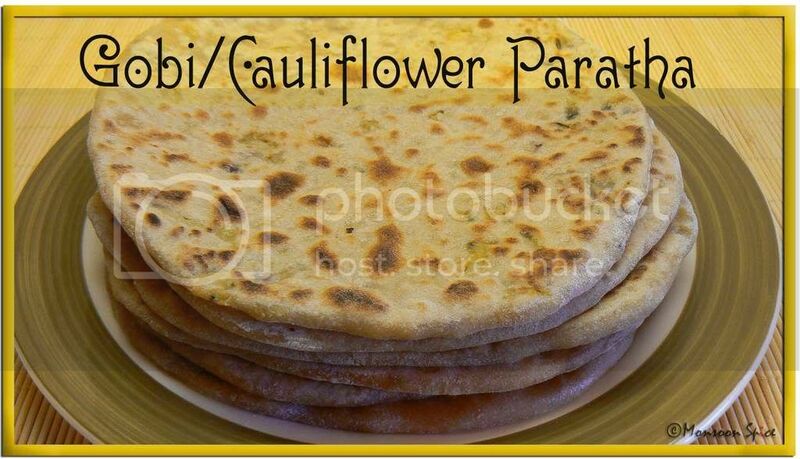 Amma, this is to you if you are reading it by any chance :) This Cauliflower/Gobi Paratha also goes to my dear friend Srivalli who is hosting Roti Mela after hosting successful Dosa Mela. Valli, I am eagerly looking forward for yet another wonderful round-up. Sieve atta and mix in salt to taste and yogurt. For the Paratha stuffing you can either cook Cauliflower for few minutes or just mix in all the ingredients with out cooking and then stuff the Parathas. If you prefer to cook it a little bit then follow the following steps. Heat oil in a pan and add cumin seeds. When it starts to sizzle, add finely chopped onions, green chillies and sauté it on a medium heat for about 1-2 minutes till onions becomes translucent. Now add roasted cumin powder, turmeric, dry mango powder, garam masala, kitchen king masala and sauté it for about 30 seconds. Mix in grated cauliflower florets, salt to taste and kasuri methi and sauté it for about a minute till all the spices are mixed well. Turn off the gas and mix in finely chopped coriander leaves and let the stuffing come to a room temperature. It is important to make sure that the filling is completely cooled before stuffing as it might ooze from parathas while rolling due to moisture content. Serve hot Cauliflower/Gobi Parathas immediately with any curry or with plain yogurt and pickle of your choice and enjoy. Always make it a point to see that the stuffing is as dry as possible. If not there is a high chance of it oozing out while rolling the parathas due to moisture content. If you are a beginner, start with small amount of stuffing/filling and roll into parathas. Once you learn the technic and are comfortable with the process, you can gradually increase the amount of filling. "Yummy blog award is given to the blog with most yummy recipes/photos". Thank you Swati and Dee for thinking of me and passing this award. I really appreciate your kind gesture. I pass this award to every food blogger as only we know how difficult it is to maintain and update your blog with new posts filled with yummilicious pictures and interesting recipes and articles. You all deserve a tight hug and pat on your back. Yummy Gobi parothas Sia... Congrats on ur Yummilicious Award! Creepy indeed! The whole point of my blog follows the theme of diverse cuisine and I thought this was only fit - event which suits my purpose in the blog-o-sphere. Even i love gobi very much yum !! Congrats on ur award dear !! Cheers !! Sia, I have tagged u for Top 10 Picture MeMe.. Pls to participate !! Those are some yummy parathas and top class photographs!! Lovely stack of parathas! Nice pictures. Congrats on the award. Welcome back Sia. I hope you enjoyed your vacation :o) I love the pic with the gobi stuffing in the flour....soooo yumm. As always great share dahling. A teenager girl with "attitude" you were :D.
I've no doubt this would be an irresistible treat! The filling certainly got my attention. Beautiful images too. yes I would also hate to say 'no' to cauliflower. I make gobi paratha once in a month..urs look perfect, especially the picture of the stuffed gobi...It looks like a beautiful flower.congrats for the award and u sure do deserve this .. u are sure one among the wonderful blogs which i admire ..
Hey sia.. ihv never tried this paratha.. shud give it a try.. and Congrats on ur award..
Actually, I love cauliflower. And in parathas, they're wonderful. And the picture does them justice. Oh yes, I felt like you were decribing me???? I was quite an arrogant and head stong girl who would fight with mom for adding mustard seeds in tempering, I used to sit and pick each one out.I was so fussy then and now you know me don't u??? I still don't use Gobi other than in pav bhaji. After looking at those gorgeous pictures, i might give it a try!! Sups, unlike you, I must have been probably boring :-D...I loved greens and was quite good with alsmost all vegetables ...cauliflower among the favourites :-)...in fact, as long as the food was not very hot,I was fine...the ones that were on my black list, and those were very few, ma, like yours and probably every other's mom (my kids' included),did the sneaky bit. 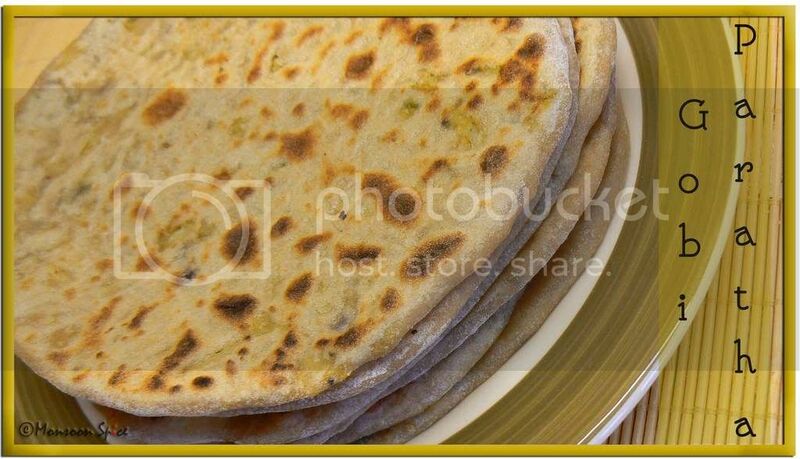 Your parathas look great...lovely pictures. YUMMY! 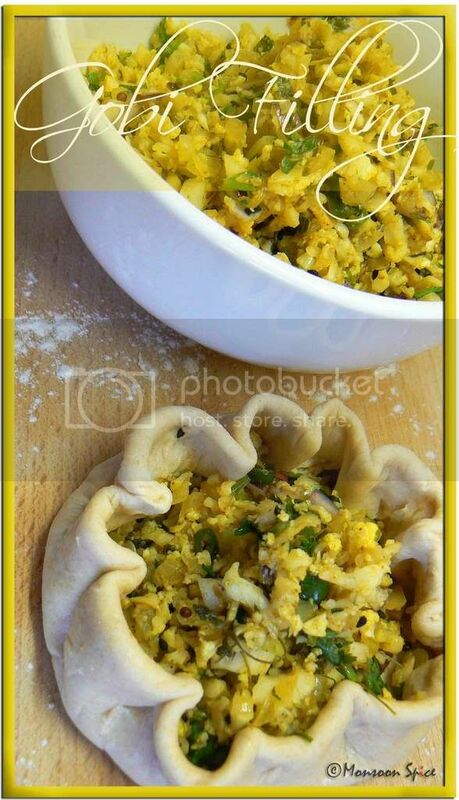 I have yet to try the Gobi and Mooli parathas, looks gorgeous! Time to call your mummy on Sunday for Mother's day even though you don't have it in UK. Hi Sia, Love those stinky parathas,My son also hates eating veggies,I do hide them. What a lovely picture and nice presentation. Congrats on the YUMMY award Sia...you really desrve this one! Wonder why I thought you were taking a break from blogging...am relieved to find you right there, & with the stack of delicious parathas!! YUM!! yes, yes, yes. cauliflower STINKS. cabbage STINKS. oohh... that felt good. could you please send me that tagging post from dining hall, sia darling? we want to re-post it. haha...I can just imagine you during your teenage years....and what about the cute dimpled cheeks? I have been there..done that! There is always one, eh?? cauliflower is allright at times....I do like it in parathas and in the gujju style that I make it in. yours looks wonderful! Nice 'paratha dish' u have there! Oh I SO relate to having a very strong opinion about veges!!! I was very fussy as a teen! Not that I am accomadating now..
Those parathas are SO yummy! Loved 'em! Paratha's Looks Very Perfect Sia..Hope The JetLag has gone by now? congrats on ur yummy award sia...i love gobi parathas.....great entry..
gorgeous parathas..nice way to hide in the veggies we hate in parathas and uthaapams..
Hey Sia, so good to have you back. You have a good way of narrating things and it is wonderful to see your recipes and beautiful photographs. Hey,you are back! Hope you had a great time in India... Stinking flower, lol, that is a brave title for a recipe :D I too hate the raw cauliflower smell, but I like it in most cooked forms. So, you didn't like even gobi manchurian?